Star midfielder Marcus Bontempelli has been selected as a vice-captain in Nat Fyfe’s FLYERS team for the 2019 AFLX tournament. Bulldogs midfielder Marcus Bontempelli has signed a contract extension with the Club. Bontempelli debuted in Round Five, 2014 and by Round 13 he’d received a NAB AFL Rising Star nomination for a 22 disposal, one goal performance in the Bulldogs’ win over Collingwood. The former Northern Knight caught the eye of recruiters pre-draft with his height, endurance and ability to play almost any position on the ground. After playing a lot of his career floating across half back and pinch hitting forward, he dominated as a midfielder in the second half of the 2013 season - showing his cleanness and proficiency around the contest, and ability to finish with his damaging left foot. Taken with the Bulldogs’ first selection (4th pick overall) in 2013, ‘Bonti’ has quickly become a permanent fixture in the side, going on to win two Charles Sutton Medals, the youngest duel-winner in history, and was a key member of the Club’s 2016 premiership. Bontemeplli was named Vice-Captain for the 2018 season. 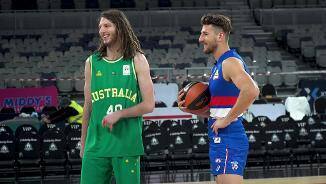 Despite his early career successes, Marcus Bontempelli spent another year developing his craft in 2018. The 23-year old was used through the midfield and up forward, finishing with 19 goals while averaging 24 disposals per game. On the eve of his 100th career match, he had surgery for appendicitis, missing two weeks of football. He returned to skipper the Dogs’ side in place of injured captain Easton Wood. In a standout match in Round 20 against St Kilda, Bontempelli had just four touches to half time. In a magnificent third term, he took his game to new heights, booting four goals and collecting 10 touches to become one of the most influential players on the ground. The 21-year-old Bontempelli followed up his stellar 2016 campaign with another standout season for the Club. Dominating most of the key statistics for the Bulldogs this season, in August Bontempelli was nominated in the extended All Australian Squad for 2017, though missed out on final team selection. An evolving role saw Bontempelli spend more time closer to goal, kicking 20 majors for the season. Bontempelli led the Dogs in total clearances (92) and total goal assists (19) this season. He also was the leading winner in contested marks and tackles averaging 6.3 per game. “I probably made some inroads in some areas of the game that I wanted to improve in but at the same time I probably didn’t get to where I wanted to in areas I targeted as well. - Marcus Bontempelli, September 2017. From the moment he kicked the first goal of the season 20 seconds into the opener against Fremantle, to lifting the premiership cup on grand final day, it’s been quite the season for Marcus Bontempelli. In between, the 20-year-old won his first Sutton Medal, was selected in the All-Australian side and was named captain of the AFLPA's 22under22 team. He also become the youngest winning captain in the history of the game when he led the side to victory over the West Coast Eagles in round 11. While the smooth moving Bontempelli’s 2016 season saw him shift into the upper echelon of the competition’s best midfielders, his ability to turn games when moved forward gave Luke Beveridge another shiny new weapon. Think Adelaide in round seven, West Coast in round 11, Port Adelaide in round 12 and a goal at the 16-minute-mark of the final term of the preliminary final to give his side the lead. The Dogs never looked back. Then there were the stats. Third at the Club for total disposals, fourth for metres gained, first for contested possessions, first for clearances, first for tackles, third for goals and first for score involvements. Still, it feels like he’s just getting started. Bontempelli finished fifth in the AFL Player Ratings, the youngest player in the top 100. “I wanted to achieve some consistency (this year) and become a player that was able to turn up week-in, week-out. That, as well as some off-field stuff around relationships with the boys. “I think that’s the thing that makes this [season] so special is the relationship you’ve got with each player here and that’s something I think I’ve grown in because of the love for the Club and the love for the people here. While second year blues might have made an easy headline, it certainly wasn’t the case for Marcus Bontempelli. The Bulldogs midfielder built on the foundations laid in his first year of senior football, and continued his rapid rise. 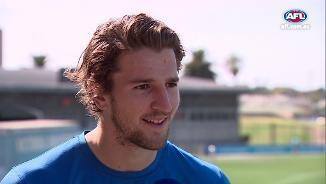 His ball-winning ability was evident from his first season, but ‘The Bont’ developed several other sides to his game under the watchful eye of Luke Beveridge and midfield coaches Steven King and Joel Corey. He had the fourth most tackles of anyone at the Club, highlighting his ability to defend, and his ‘clutch’ goals showed his ability to head forward and step up in big occasions. He averaged 21 disposals, five tackles and three marks, and ranked sixth in the league for inside 50s. The 19-year-old was selected in the AFL Players Association 22 Under 22 team, and finished second on the Dogs’ leader board in the AFL Coaches Association Player of the Year award. 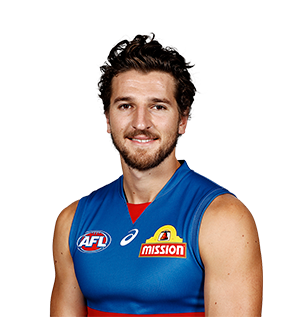 Bontempelli soared into the Top 20 AFL Player Ratings at the end of the season. Currently at 11th in the rankings, he is the youngest player in the top 100. 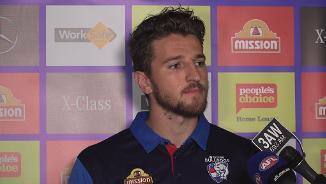 If Marcus Bontempelli’s debut season at the Kennel was a pointer to the career that lies ahead, then Bulldogs fans have much to look forward to. Around the stoppages, down back, and in front of goals, Bontempelli showed in his first year that he had the tools to do it all. Recruited from the Northern Knights with the fourth pick overall in the 2013 NAB AFL Draft, Bontempelli played 16 games in his first season of AFL football after debuting in round five against Carlton. But despite the hype and highlights reel, it’s the ethic of the humble, unassuming and hard-working teenager that has had most in awe. Bontempelli won the Club’s Chris Grant Best First Year Player Award at the Sutton Medal in September, and earned the praise too of his peers at season’s end, Bontempelli was a landslide victor in the AFL Players’ Association Best First Year Player Award. The 18-year-old polled nearly five times the votes as runner-up Luke Dunstan of St Kilda, becoming just the first Bulldogs player to win the award. Bontempelli was runner-up in the NAB AFL Rising Star Award to Brisbane’s Lewis Taylor, missing-out by just one vote in the closest polling in the award’s history. He averaged 16 disposals and one goal in his debut year, and earned a Hungry Jacks Goal of the Year nomination for his match-winning snap against Melbourne in round 15. Bontempelli collected 20 disposals or more on four occasions in his first year, with his 24 disposal match against Port Adelaide his most prolific ball winning performance. Bontempelli’s versatility both up forward and through the midfield saw him rank first out of all first year platers in the competition for inside 50s, third for clearances and fifth for goals. “I think if you buy into your own press you can start to drop off in your own performance - you can't think about it too much.” Marcus Bontempelli speaking ahead of the NAB AFL Rising Star Awards. “I’m so grateful to have joined such a great club, and a great group of boys…I can’t wait to go on into the future with this group.” – Marcus Bontempelli speaking at the Sutton Medal. “He has been a pleasure work with for the coaches and the senior players love him for his attitude and desire to get better… a couple of VFL games that Marcus played earlier in the season were just exceptional, so it’s no surprise to us that he has been able to step in and actually make a very sound contribution early.” List Manager Jason McCartney on Bontempelli.